LegalShield, one of North Americas leading providers of affordable legal plans and the IDShield identity theft solution for individuals, families and small businesses, announced today that it will hold its annual We Are LegalShield Convention, March 14 through 18, at the Cox Convention Center in Oklahoma City. At this years five-day event, LegalShields new and experienced Independent Sales Associates will come together from all 50 states and Canada to engage with leading expert speakers, receive specialized professional development training and find crucial networking opportunities. Among the keynote speakers is Jack Canfield, award-winning author of the Chicken Soup for the Soul’ series and a leader in personal development and peak performance strategies. Arkansas Attorney General Leslie Rutledge will speak of her crusade for equal access to justice. 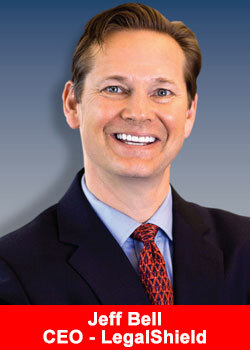 LegalShields top executives, including CEO Jeff Bell, will also deliver remarks to the crowd, expected to exceed 8,000. The 2018 We Are LegalShield Convention will also include professional training sessions organized into four tracks of four courses each, covering the fundamentals of business to business sales, network marketing, technology/product and personal development. Recognition plays a key role as well. LegalShield will honor the dedication and hard work of its associates with awards for best achievement in eight categories, including production growth and retention. Bell said, As we enter our 46th year of operation we are protecting and empowering 4.375 million lives. A pioneer in the democratization of affordable access to legal protection, LegalShield is one of North Americas leading providers of legal safeguards and protection against identity theft solutions for individuals, families and small businesses. The 45-year-old company has more than 1,751,000 members that are covered by its legal and identity theft plans. IDShield provides identity theft protection to one million individuals. LegalShield and IDShield serve more than 141,000 businesses. Both legal and identity theft plans start for less than $25 per month. LegalShields legal plans provide access to attorneys with an average of 22 years of experience in areas such as family matters, estate planning, financial and business issues, consumer protection, tax, real estate, benefits disputes and auto/driving issues. Unlike other legal plans or do-it-yourself websites, LegalShield has dedicated law firms in 50 states and four provinces in Canada that members can call for help without having to worry about high hourly rates. IDShield provides identity monitoring and restoration services and is the only identity theft protection company armed with a team of licensed private investigators on call to restore a members identity. Get more information, fact and figures about LegalShield, click here for the LegalShield overview.